Thread: Just bought my first RGB product! ... not that it was in any way part of the reason I bought it, but I guess I couldn't avoid it forever seeing as there is barely a single rock left unturned in the market now. I've never fully gelled with my G500 in the same way as I did with the G518 that came before it and I felt like it was time for a change. 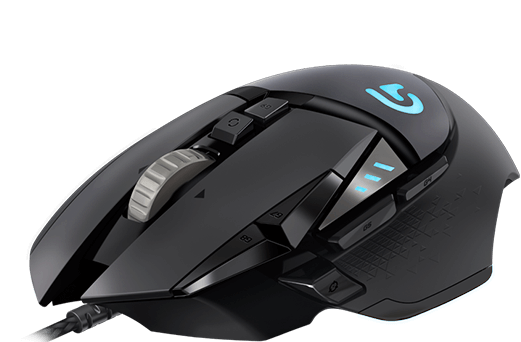 I looked about in the market at Corsair, Razer, Roccat etc... but it had to be logitech still.... so its the G502 Proteus Spectrum for me... what a ridiculous name. So what RGB products have other people got so far? Re: Just bought my first RGB product! My CPU cooler is RGB (side note - in the process of doing a build log). What's the mouse like? I've had a G602 for just under two years, and recently the scroll wheel broke. I had it replaced and the quality is horrendous! It feels like a cheap rip off. The new mouse's buttons are squishy and wobbly, it creeks... Anyway..
Hasnt arrived yet, but Ill definitely have to pay special attention to it! I have a Func MS-3 R2 which is RGB,but I have not really mucked around with the colours. I suspect all I'll do is set it to white and leave it at that! I've just moved my "rig" into a NZXT S340 Elite (full tempered window), and it was a little too dark. I never thought I'd ever use any lighting (and I still didn't stoop down to RGB levels ), but I did succumb and put some white led strips in strategic locations and I do quite like the results. I think I left it on the default colour IIRC. It seems like there is very little buzz about RGB in Hexus, are we just a community of old computer enthusiasts who arent down with the Kids, or is the industry just in an echo chamber creating its own hype over RGB? The whole RGB thing still feels like a giant parody to me. Well I tend to have always preferred understated looking cases with a minimalist look - I currently use an aluminium mini-ITX case in black which is not at all flashy. I've been down that route before - I have had RGB coloured fans, temperature displaying fans, even memory with rude messages scrolling down it on LED strips and now I have gone down the other route, where the PC is hardly lit up, with only the white LED from power and HDD activity. I much preferred the green cold cathode tubes, although by the end of the machine's life they'd faded badly. In terms of more recent combined RGB products probably just a rapidly defunct logitech G600. It's looking like I might end up with a motherboard with them though, even if I'll probably manage to avoid them on the graphics card. I suspect it's just a large proportion of people willing to put up with silly styling and RGB LEDs. If it doesn't impact sales then it's more cost effective to make just one version even if the number of people who actually want that feature is relatively small. I've got a cooler master masterkeys pro L mechanical keyboard. I didn't buy it for the RGB, rather, a cheapish way into a compact mechanical keyboard. However, I now have it set to slowly wave through rainbow colours, because I'm a unicorn. I recently jumped on the RGB band wagon... purchased the Corsair HD120 RGB 120mm LED 3x Fan Kit with Lighting Controllers. A month after the novelty wore off and decided to replace them with Noctua NF-P14s Redux fans. I've been trying to sell them at a ridiculously low price, no one wants them!!! I have had many RGB products, including my current keyboard(currently on white). I think the pictures etc on products make them look more exciting than they really are. My keyboard can cycle millions of colours but its so off putting and just looks cheesy. What Jon said. I had an rgb keyboard and mouse. Looked like the proverbial epileptic frog. Changed the keyboard to just a red backlight and turned all the other leds off.